Broccoli is a staple for many families that want to eat healthy. It isn't exactly cheap though! Growing broccoli in your garden just might be the answer. Broccoli is a cool season vegetable that can be planted in early May in Zones 4-6 and in September and February in Zones 7-10 (check to see your growing zone). You can grow broccoli from either seeds or transplants. To try a few different varieties, stick with seeds. Transplants though are a bit easier when growing broccoli. Two plants can feed a family of four. Plant additional broccoli plants though if you want to freeze fresh broccoli for when it is out of season. Broccoli needs a bit of space to grow. A mature plant can grow to 12-14″ so seeds should be spaced at least 12″ apart. You can harvest broccoli throughout its growing season and not grow a traditional head. 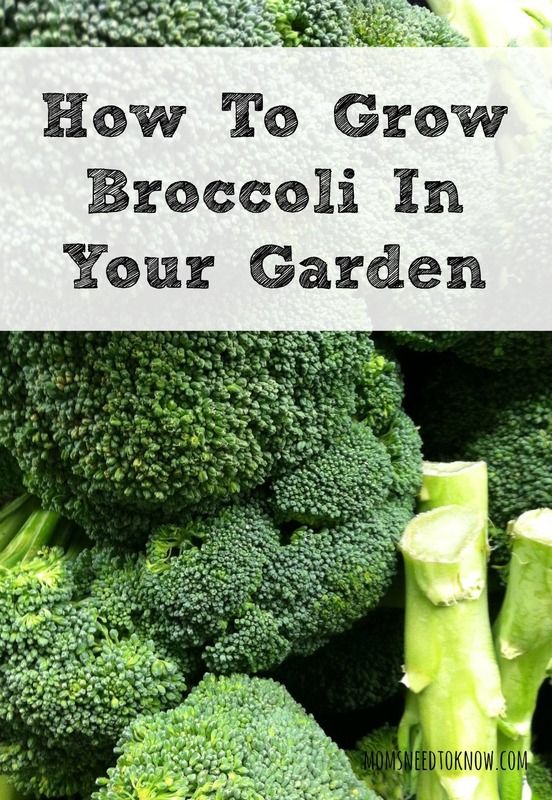 Grow broccoli in a raised bed or out in the vegetable garden. It also can be grown in a container as the main focal plant with other herbs and veggies planted around it. Broccoli should be planted in nutrient-rich soil like compost or organic potting soil. If you aren't already composting, it is really easy to do! Broccoli uses a lot of nitrogen, so plan on adding Blood Meal to the soil every four weeks as a fertilizer to the plant. If possible, have an irrigation system installed to give the broccoli plant water on a regular schedule. They don't like their roots to dry out and thrive in evenly moist soil. Broccoli will grow faster and larger with regular watering. You can start harvesting the broccoli shoots as soon as 14 days after they have sprouted. Cut the stem down to the main plant. This signals to the plant to grow additional stems. Keep harvesting this way if you don't want a main head to form. If you do want the regular head of broccoli, only remove the outer shoots and leave the main crown in the center. Once the broccoli crown is at least 6″ in diameter, you can cut it off or let it grow larger, depending on what variety you are growing. Will you be growing broccoli this year?